I'd been hearing for some time online that the Thalans were arguably the most overpowered race in Galactic Civ 3. After playing a game with most of the other races, I decided that I had to give them a spin and find out if the conventional wisdom was true. I admit that I didn't quite understand at first why there was so much fuss about these guys. Their traits didn't look anything all that special from the setup screen. I would soon learn that it's not the Thalan traits that make them strong, but rather their unique tech tree, which is packed full of powerful (and frankly overpowered) stuff. The Thalans are an insectoid race of aliens. They have an unusual background story; apparently the Thalans are from the future, and were sent back in time to try and prevent the destruction of the galaxy. They claim that humans are the culprits, which is simultaneously amusing, depressing, and all too likely to be true. For traits, the Thalans are Productive (+25% manufacturing), Militant (+10% shipbuilding), Agile (+25% evade in combat), Resilient (+15% faster ship repair), and Organized (+10 logistics). They have a brutal penalty in the form of the Infertile trait (-25% growth) and a less serious penalty in being Unlikeable (-1 relations with all races). It's pretty clear how this race is supposed to work: they're very good at manufacturing and fleet to fleet combat, with this being balanced out by slow growth and poor diplomacy. Other races definitely have better setups from a trait perspective; this is fairly mediocre. For their racial abilities, the Thalans are Intuitive and Knowledgeable. Intuitive ability grants the Thalans 500 free beakers at the start of the game, at least according to the GC3 wikipedia. 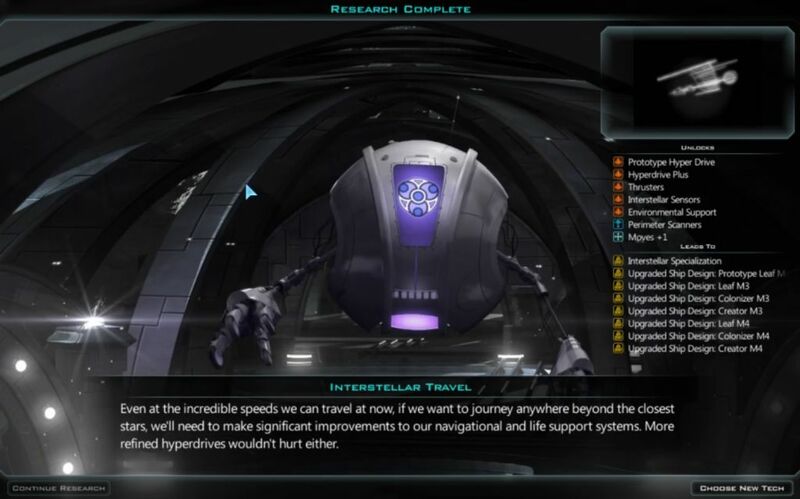 The in-game interface provides no such detailed information, simply stating that the Thalans "start with extra research" or something vague like that. I tell you, this game's interface really feels like it's still stuck in beta. (And check out that title above: FORM another time?! Spellcheck, anyone? ) Intuitive is a neat idea for a racial ability, and it can be leveraged to provide a major boost at the start of a game. Knowledgeable ability grants the Thalans visibility of the other homeworlds on the galactic map. It's helpful for knowing where to explore in the early game, but not really anything to write home about. I chose to roll a Small galaxy with three opponents for this particular game. I set the difficulty to Incredible, which was a new addition in one of the patches. It hadn't even existed when I played the last game with the Iconians. The developers wisely chose to consolidate difficulty level into one item on the setup screen. 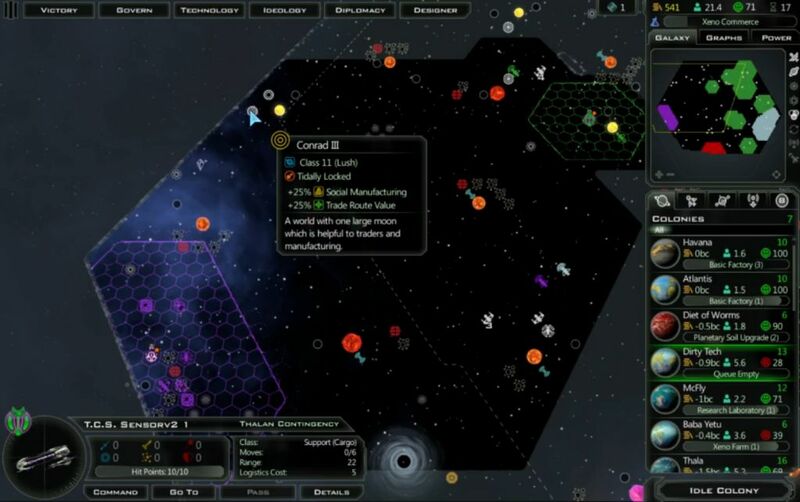 Previously, you had the option to set a difficulty level for the galactic map, and then ANOTHER difficulty level for the AI opponents. It was confusing and unclear exactly what was happening with each option. Now there's only one choice for difficulty; selecting "Incredible" sets all AI opponents to Incredible performance level. Much better. Incredible is the second-highest level right now, 6 out of 7 on the scale. I had no idea how competitive the AIs would be here, and was curious to find out. My bugs started in the northeast corner of the galaxy. Due to Knowledgeable ability, I could see my three opponents on the zoomed out map: Iconians in the southeast, Drengin in the deep south, and Yor in the west. All four of us had spawned in the corners of the map this time, leaving the center of the map wide open. There was also considerable breathing room, with no AI empires particularly close. This was a welcome contrast from my previous GC3 game! For whatever reason, the map was also glitching a bit and not showing the edge of the galaxy the way it's supposed to do, and then the background had some weird colors after I reloaded trying to fix the problem. What can I say, GC3 is very much still a work in progress. The later engines are clearly much better. Ion engines provide 200% improved movement for 40% additional cost compared to the starting engines. Tough to beat that deal. I saw this as a more important benefit than anything else that I could grab on the tech tree. Who cares about infrastructure or military stuff - there will be plenty of time to build that later. 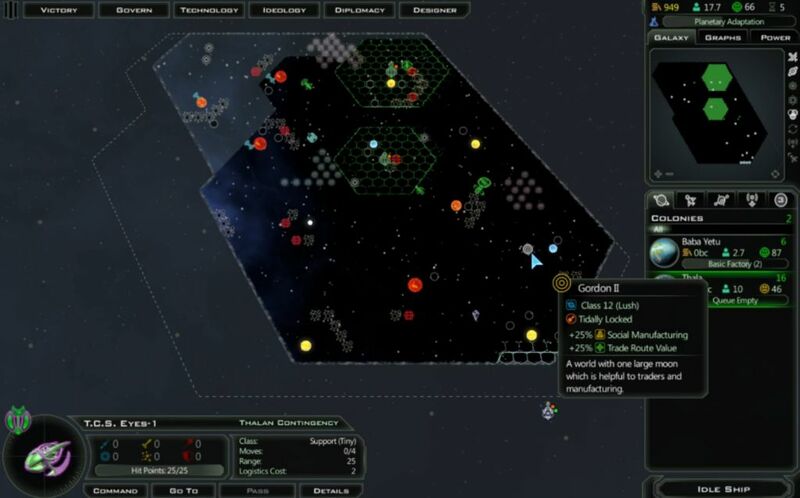 Right now, what I needed was ships that could explore the map quickly, followed by colony ships beelining to their destinations. The bigger the map, the more powerful these movement techs become. Even here on a Small galaxy, having tier 3 engines would prove to make a massive difference. The Thalan trait knocked out about 95% of the tech's cost, and I would finish the rest on the first interturn. You know what the speedrunning community says, gotta go fast! I played the opening in a similar fashion to my Iconian game. The first few turns were spent cash-rushing factories on the home planet, and I bought a sensor ship out of the shipyard on the first turn to reveal the local terrain. Since I also finished researching Ion Drives at the end of that first turn, I was able to redesign the sensor ship and upgrade the one on the map to use the new technology. This sensor design would have 18 visibility, 22 range, and 6 movement points. That made a huge difference: my non-Thalan sensor designs normally have 3 movement points! I'd be speeding around defogging the map at a greatly increased rate. 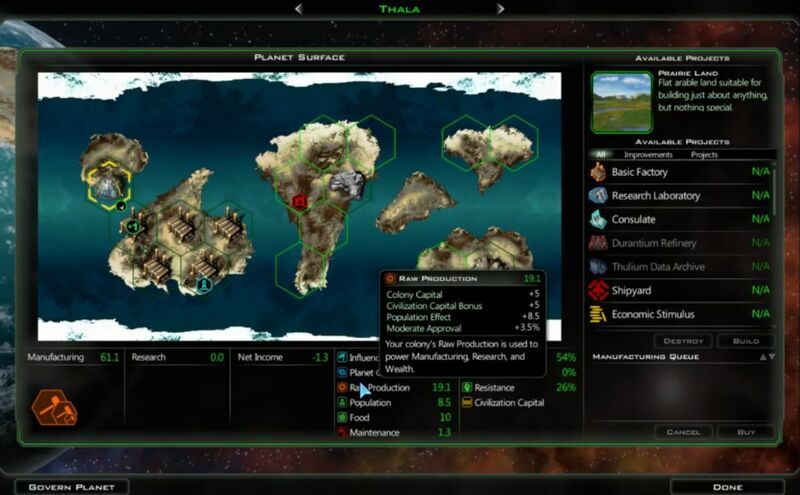 The Thalans do not begin the game with any planets in their home system. (Their homeworld is a very nice Planet Class 16 world to compensate.) My sensor design found a single planet off to the south, which I would wind up renaming Baba Yetu after colonizing it. Although this was a relatively weak planet at a mere class 6, there looked to be few other options available. Sending the starting colony ship here was an easy decision, for extending range if nothing else. I decided to send my sensor ship to the southeast, as the Iconians were the closest and located in that direction. 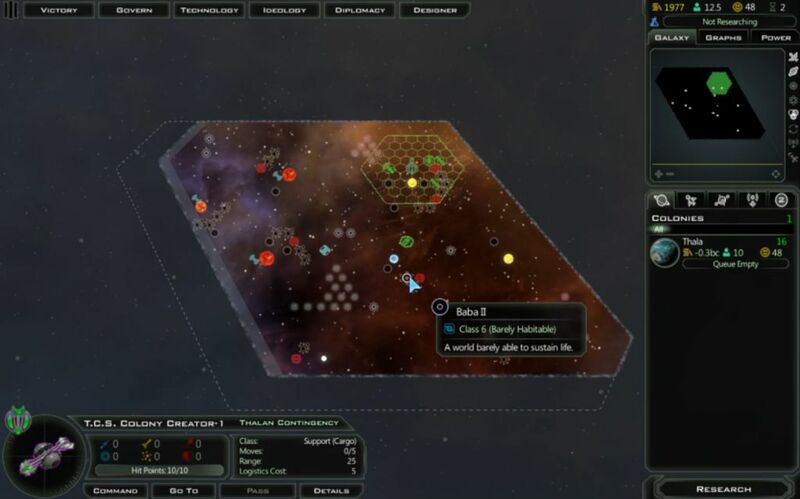 That was one nice advantage about having the AI homeworlds revealed on the map. There was a large zone of dead space off to my west before reaching the Yor, and I figured any planets there would be safe for quite a while. So the plan was to swing south first, lock up any border with the Iconians, and then move west after that into the less contested area. It didn't take long to start building colony ships on the homeworld. 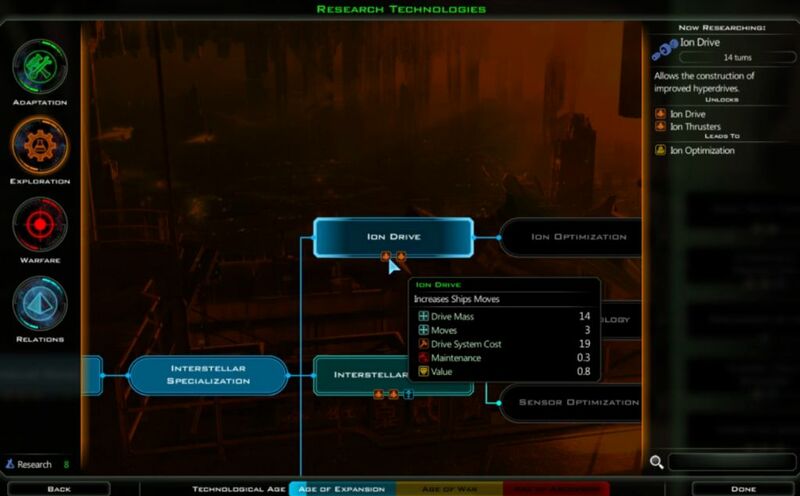 All I had to do was finish researching Ion Drives on the first turn, and then there was nothing else critical to grab. I was building colony ships at Thala even as I was cash-rushing out additional factories. The colony ship design that I came up with is pictured above. After putting on the colony module itself, I had room for 3 ion drives. That meant 12 movement points - wow! Those extra technologies from the starting Thalan ability made a huge difference. There was even just enough room for a life support module, extending range out to 22 tiles. I would use this design repeatedly throughout this game. There was no need to come up with another version, this general purpose colony ship excelled at everything. On Turn 5, I spotted another colonizable world to the southeast. This was a pretty nice planet, class 12 with some positive bonuses to social manufacturing and trade. It was roughly equidistant between my start and the Iconians, perhaps slightly closer to their homeworld. Now I had a clear target for my first colony ship, which would immediately start heading south at full speed as soon as it was done. The sensor ship just makes such a huge difference - can you imagine having to fly colony ships blindly into the fog? 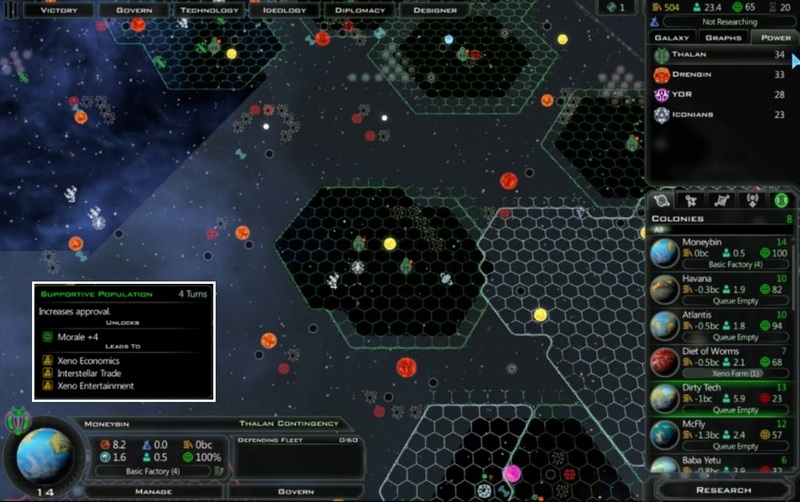 I'm kind of glad that there is a tool for defogging the map quickly, it would be stupid having games won or lost based on finding or not finding planets with dumb luck scouting. Back at my home planet, I wanted to highlight one of the best improvements in this new patch version. The designers have added a new category called "Raw Production"; if you look at my screenshots from the previous GC3 game, this wasn't present on the interface in older versions. Raw production itself isn't new, however - it was operating in the game from the earliest stages. It just went undocumented on the interface, which made it difficult to understand how the local economy was functioning. Anyway, raw production is essentially the base amount of "stuff" that the planet spends each turn. This is what gets funneled through that big three-way wheel and assigned to manufacturing, research, or wealth. Raw production mainly comes from population, with the base stat being 1 population = 1 raw production. The colony capital also always produces 5 raw production, and since Thala is my homeworld, there's another 5 raw production here for being the empire's capital. The 19.1 raw production then gets assigned on the wheel (in this case going 100% to manufacturing) and fed through whatever multipliers might be there from buildings. It looks like Thala was getting about +200% manufacturing from those factories I had built. Now that raw production is displayed on the colony screen, it's much easier to see where all these numbers are coming from. By Turn 8, I had already claimed the planet to the southeast, renaming it McFly as suggested on Livestream. (We're Thalan time-travelers!) My sensor ship had also revealed about a quarter of the galactic map by this point, and this particular turn revealed two more habitable planets. 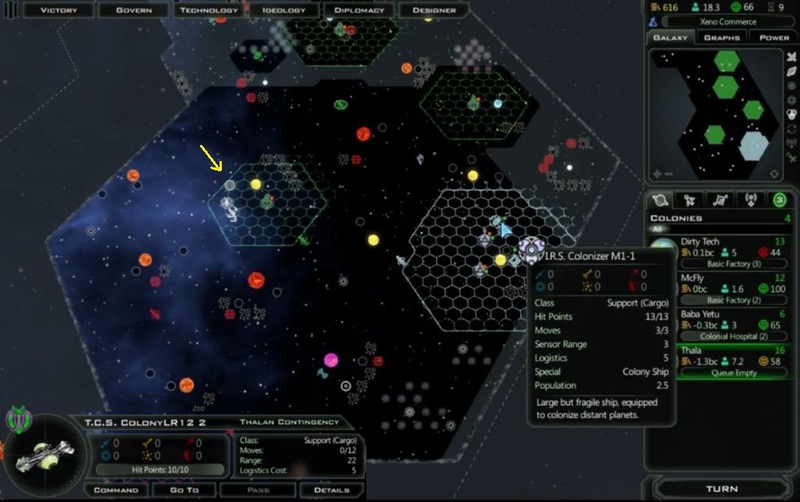 One of them (Sydney I) was towards the center of the galaxy, over near that pirate base. It was a very nice planet, I think PC 13 or something similar, and located in a highly strategic location. Whoever could control that spot would open up the middle of the galaxy. It was a minor stroke of good fortune that this planet was just barely within range; apparently it was exactly 22 tiles away from McFly on the map. Now I wouldn't need to design a new colony ship or fiddle with constructors for starbases. I could head directly for this sweet spot. Of course, that was only one out of the two planets visible. Kimedwa I was a little planet down in the deep south, and not the most attractive target. Only PC 6 and with a growth penalty on top of that? Let's just say that it wouldn't be my fist choice if the planets all gathered together for a game of pickup basketball. However, as I've repeated before, every planet is worth having in this game. Better me than the Iconians. Could I manage to get down there before them? I had no idea at this point, and I would need to colonize the other planet first to extend range down to Kimedwa. With those tier 3 ion drives speeding my ships, I thought I had a shot here. In the social policies department - err "Ideologies", sorry! - I decided that I would go for the Outreach line of the Benevolent tree this game. I've found the Benevolent tree to be my favorite of the three ideologies, with all four of the paths having good stuff on them (colonization, morale, influence, and research respectively). 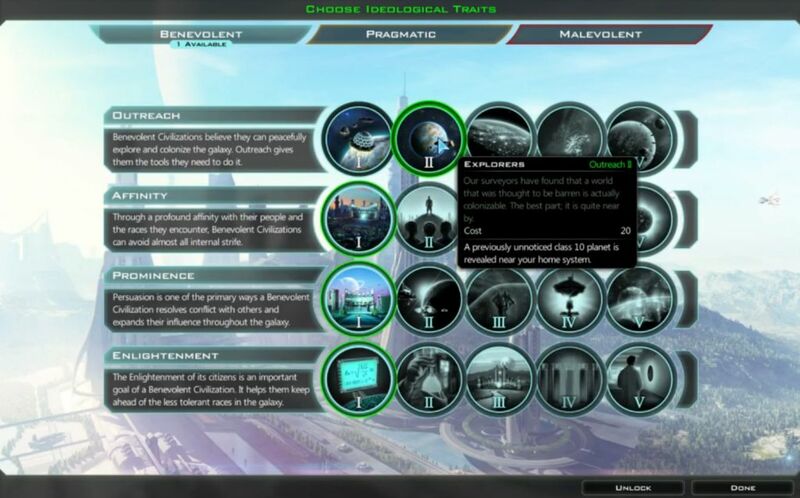 I like some aspects of the Malevolent tree as well, and that ideology has the single best policy in the game: "Eager", a global morale bonus from conquering enemy planets. However, there's also some unnecessary stuff in the Malevolent tree, particularly the Greed and Awe lines, and the Motivation line with its nice manufacturing bonuses are often overkill. I've typically found that you don't really need that much manufacturing in GC3. As for Pragmatic, that ideology is simply underpowered compared to the other two. I might do a variant game at some point to show it off, but that's all it is right now, variant material. 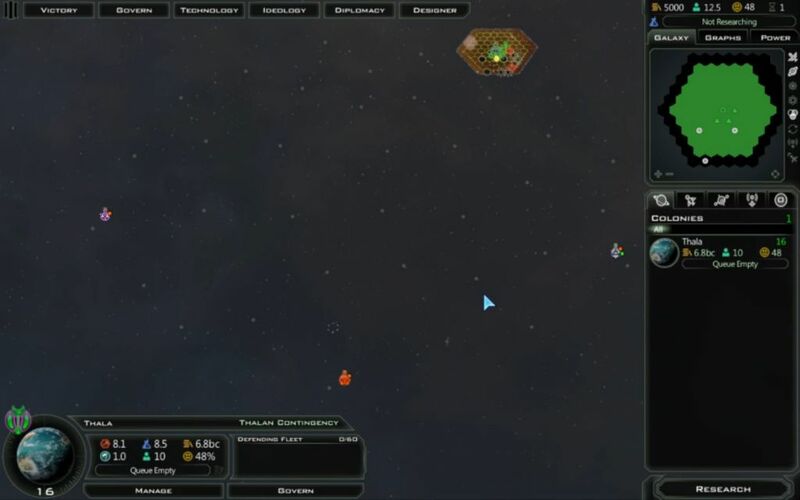 The first policy (screw it, we all know this mechanic was stolen from Civ5, I'm calling them that) in the Outreach line grants your empire a free colony ship. Unfortunately you don't get to pick the colony ship design, and the one that appeared was "crawling" along at only 6 movement per turn. I had it headed to that strategically located world near the pirate base in the center of the map. The second policy in this line causes the appearance of a "previously unnoticed class 10 planet" on the map, "near your home system." 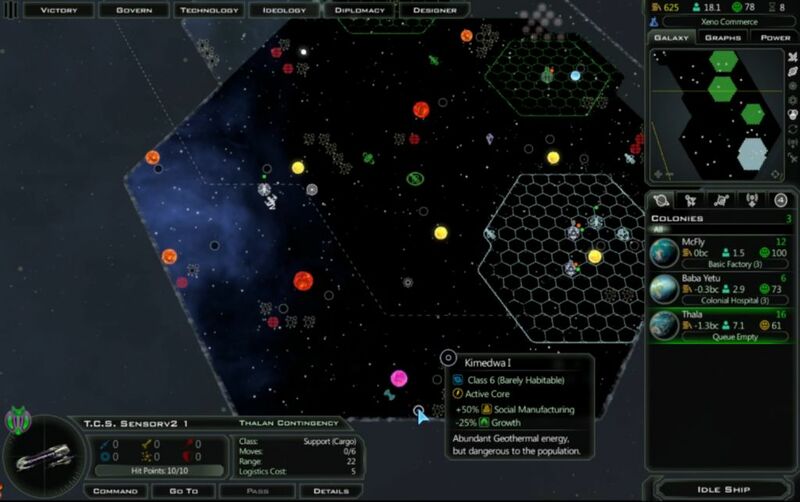 That's the reason why I had chosen to head down the Outreach path in this game: this being a Small galaxy, I thought having a whole extra planet would be a big advantage. The top policy in this tree also grants a size 16 paradise world in the same fashion, which I thought would be cool to have. On the smaller maps that I play, these are strong policies. On one of those gigantic maps with 1000 stars, these policies would be almost useless. See it? The new planet is right next to the newly colonized world of Dirty Tech, north of the pirate base. (If you scroll up to the previous screenshots, you can see that the planet did not exist there previously.) Umm... what the heck? The policy description said "near your home system". This planet was a good 35 tiles away from Thala - that is not near my home system! I thought that this would deliver a safe backline planet that I could colonize at my leisure. Instead, it dropped a planet into a highly contested part of the map, in a place where an enemy world would clash with my own colony next door. This was not what I signed up for! 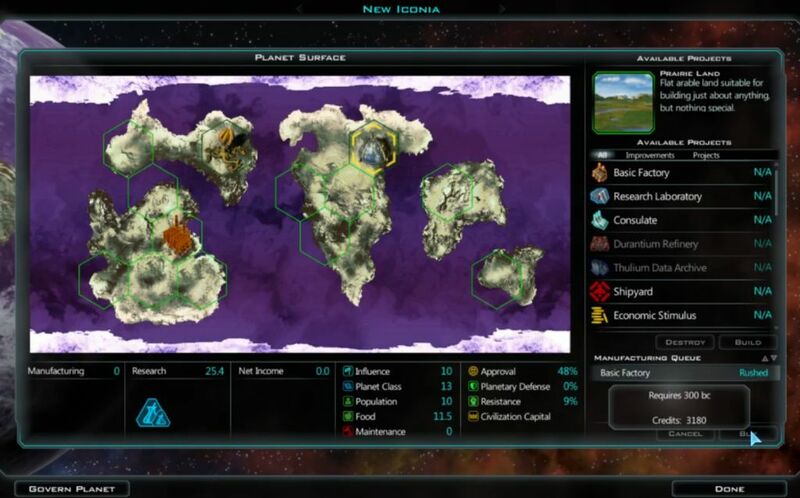 Making matters worse, the Iconians had their first colony ship out on the map already. 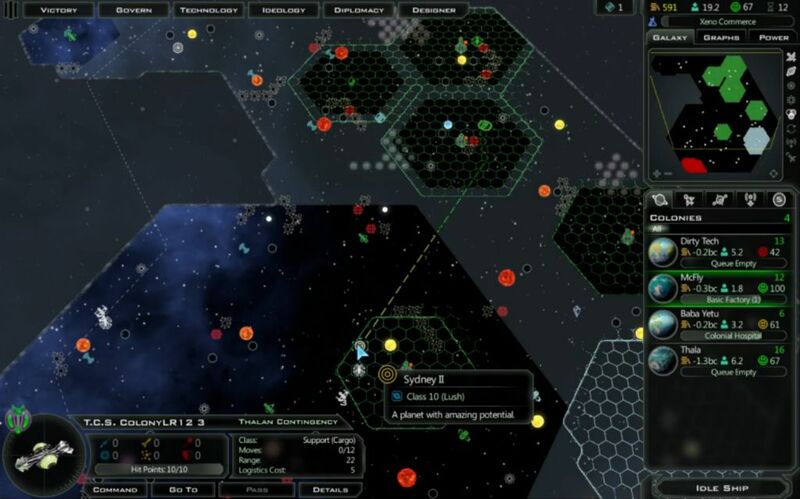 The AI cheats with map visibility on the higher difficulties, and they always know where all the planets are located. (This is the reason why I don't feel guilty about the sensor ships, the AI cheats outrageously when it comes to vision.) The Iconians won't need to scout this new world, they'll simply head here immediately. I did have a colony ship on the way, fortunately, but it looked as though I might have to make a decision between claiming this world or the little Kimedwa system in the far south. Now here's the good news. 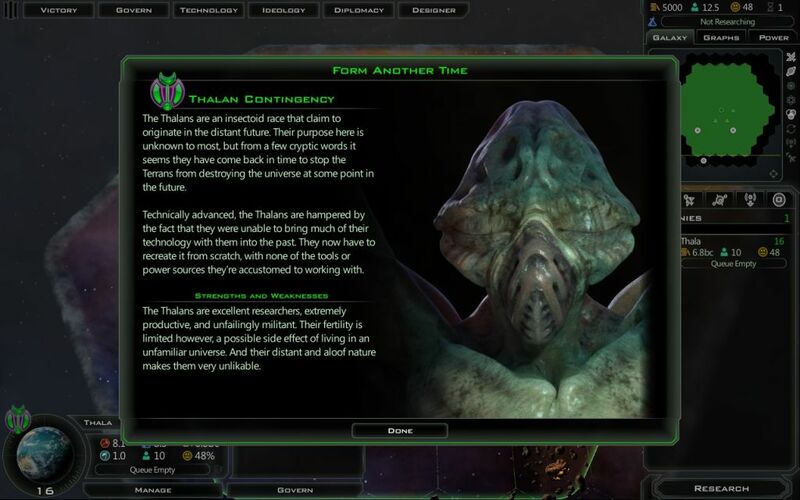 The Iconians have only 3 movement on their colony ship. With my early push to ion drives using that free Thalan research, my colony ships have 12 movement. It's actually pretty hilarious how slowly they move between turns compared to my designs. Thanks to my engine tech, I don't necessarily have to compromise here. If I'm willing to send my current colony ship down to Kimedwa, I can send the following colony ship to the central location, potentially securing both... at the risk of losing both worlds if I'm unlucky. Was it worth the risk? Of course it was! I intend to push for Kimedwa. Here's the scene three turns later. Look at how fast my colony ships move on the map! Only three turns needed to get from Thala's shipyard down to Sydney II, almost three dozen tiles away. Have I mentioned enough times how speed is a killer in this game, and the AI remains completely clueless about how to use it? Meanwhile, my previous colony ship was also racing further south to the Kimedwa system. 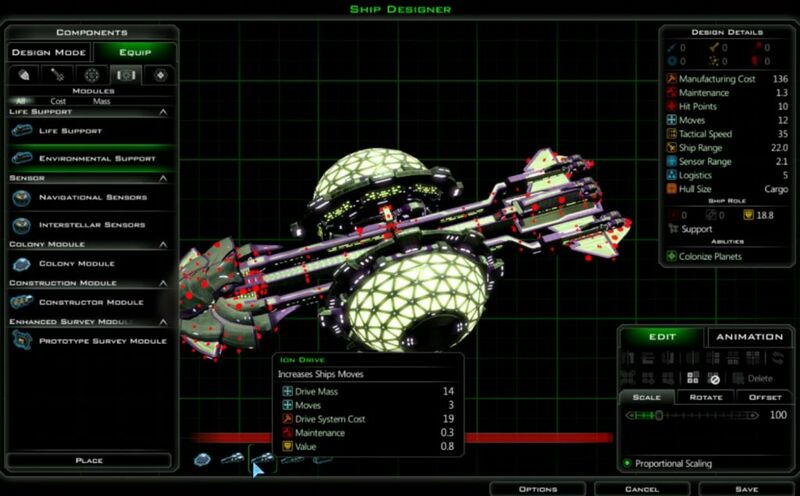 It's the green ship just below "amazing potential" in the screenshot. The poor Iconians were nearby, their colony ship just to the east of that same text box, but they were too late to the punch. They would never be able to close the remaining distance to either world before my ships made it first. Chalk up another victory for the landgrabbing Thalans. Up to the north, I had slipped in a single constructor build amongst all the colony ships and dropped a starbase to the west of Thala and Baba Yetu. 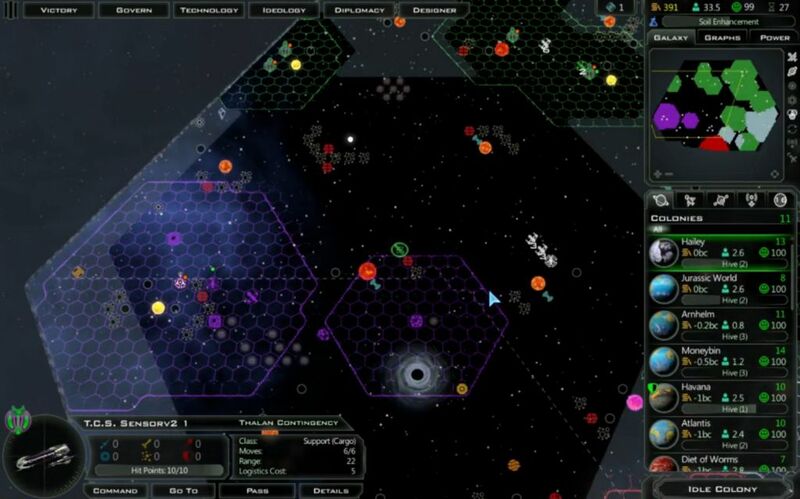 The starbase picked up Durantium, Thulium, and an influence relic, narrowly missing a few more resources. The main reason it was there was to extend range, however, opening the path to yet another planet off to the west. I found that one with the survey ship, and the sensor ship would be moving into this region as well as it continued its grand clockwise circle of the galaxy. There were still more planets out there for the taking. The Drengin weren't that far off to the southwest from these spots. I hadn't seen too much of them so far, probably because it was only Turn 13 after all. The fact that I could scout out a planet this far away and then manage to colonize it so quickly was honestly kind of ridiculous. How did the Iconians manage to lose this spot to a race that started up where I did?! Not the best showing from the AI. More unclaimed planets! This pair was located to the northeast of Yor territory; the Yor homeworld is also visible in the picture. These planets were both on the smaller end, and I expected that the Yor would likely get at least one of them before I could manage to send some colony ships. This looked like the proverbial bridge too far. Nevertheless, even if I missed these planets it had already been a spectacular landgrab. I had just founded Havana at the yellow star on the east side of that screenshot. Moving the sensor ship had revealed that there wasn't one planet hiding in that fog to the west of my homeworld - there were three planets there! Colonizing either one of the remain unoccupied worlds would give me enough range to leapfrog over to the Conrad system. That would be the ideal scenario, taking one of the closer planets, then both of the Conrad worlds, then back for the final unclaimed planet. I could only hope that the Yor would give me enough time to pull it off. This was Incredible, the second-highest difficulty level. What was going on here? That definitely should not be happening. A combination of the Thalan starting tech bonus and this fantastic landgrab was starting to leave the AIs in the dust. They were not expanding fast enough, and I was snapping everything up with my hyper-charged colony ships. If it's bad now, what's going to happen when these fledgling colonies actually begin to mature? I colonized Moneybin for planet #8, the one which would extend range and bring the two planets in the Conrad system into poaching distance. As the name implied, Moneybin would be a planet specialized for wealth generation. You seem to need about one of these for every ten planets overall; GC3 is pretty forgiving when it comes to the money side of the game. When it came to research, I had finished Planetary Improvement and Xeno Commerce techs, and I was now heading for Supportive Population's massive +4 morale benefit. Going for Planetary Improvement first (following Ion Drives) had been a mistake, and I'll explain why a bit later. The Xeno Commerce to Supportive Population push was designed to solve my low morale, and that was definitely not a mistake. I'm honestly not sure why Supportive Population is so blatantly overpowered - it could be lowered to +2 morale and it would still be awesome - but I'll keep using it as long as it's there. Improving my morale would improve the raw production of each planet, speeding along their infrastructure, research, and influence growth. 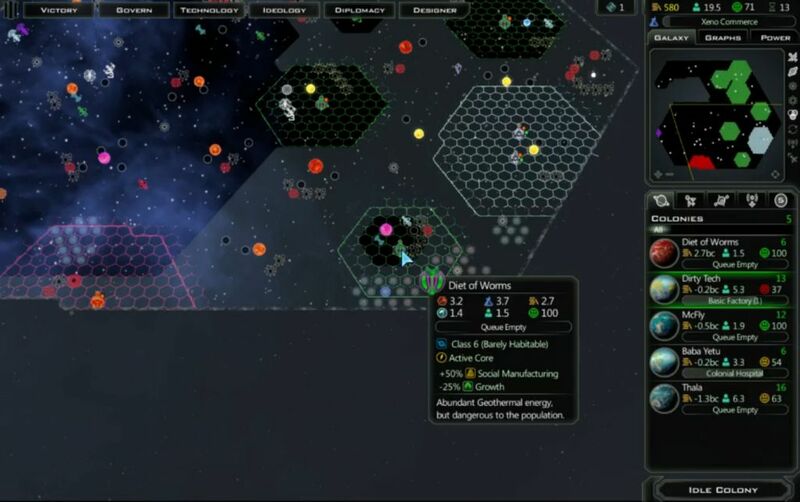 Generally speaking, first you colonize as many planets as possible in GC3, then you get morale techs to solve the unhappiness created from colonization. Or at least that's what I do. For a Small galaxy, that was a large number of planets indeed. I had been helped by the star layout of this map, which had big gulfs of space near many of the AI homeworlds and an easy stepping stone pattern that led from one colony to the next. I never had to worry too much about range concerns. I stole all the worlds near the Iconians, there were no worlds near the Drengin, and the Yor made no move to colonize the planets located to their northeast. As it turned out, I had run a clean sweep of the map. Every single planet outside of the AI home systems was colonized by my Thalans. Every. Single. Planet. The Iconians had two planets, the Drengin had two planets, and the Yor had only their homeworld. I had ELEVEN planets! All hail the power of faster engines! I never would have made it to all these spots without the 12 movement colony ships, and the 6 movement sensor design to spot them quickly.